One of the largest churches in the city, it has the status of a minor basilica. 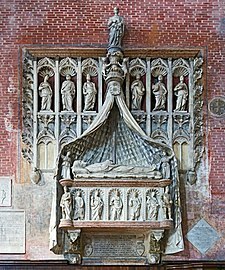 After the 15th century the funeral services of all of Venice's doges were held here, and twenty-five doges are buried in the church. 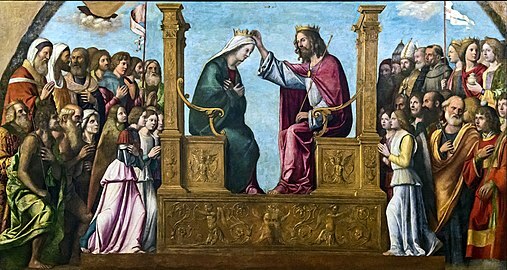 The vast interior contains many funerary monuments and paintings, as well as the Madonna della Pace, a miraculous Byzantine statue situated in its own chapel in the south aisle, and a foot of Saint Catherine of Siena, the church's chief relic. San Giovanni e Paolo is a parish church of the Vicariate of San Marco-Castello. Other churches of the parish are San Lazzaro dei Mendicanti, the Ospedaletto and the Beata Vergine Addolorata. 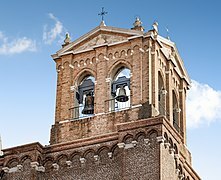 The belltower has 3 bells in D major. 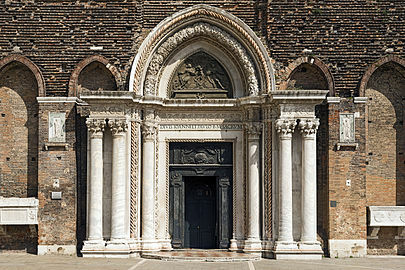 The facade of San Giovanni e Paolo. Veronese (The Assumption, The Annunciation and The Adoration of the Magi on the ceiling of the Capella del Rosario; The Adoration of the Shepherds in the Capella del Rosario). The famous The Feast in the House of Levi, painted for the refectory, is now in the Accademia Gallery. 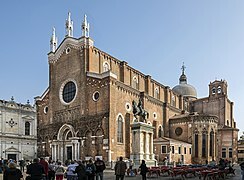 Built in 1582 to commemorate the victory of Lepanto, contained paintings by Tintoretto, Palma the Younger, Titian and Giovanni Bellini, among others, but they were destroyed in a fire in 1867 attributed to anti-Catholic arsonists. 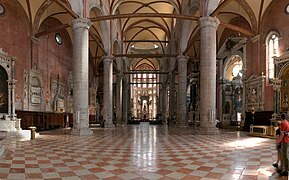 Sant'Anastasia (Verona) — similar Dominican church in Verona. 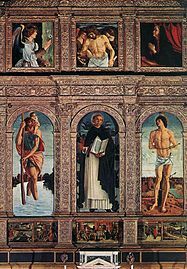 Wikimedia Commons has media related to Santi Giovanni e Paolo (Venice). This page was last edited on 31 October 2018, at 11:50 (UTC).